34 More Kids Are Finding Possibilities! 34 More Kids Received Life-Changing Equipment. Something that will help them find greater possibilities for their own lives! 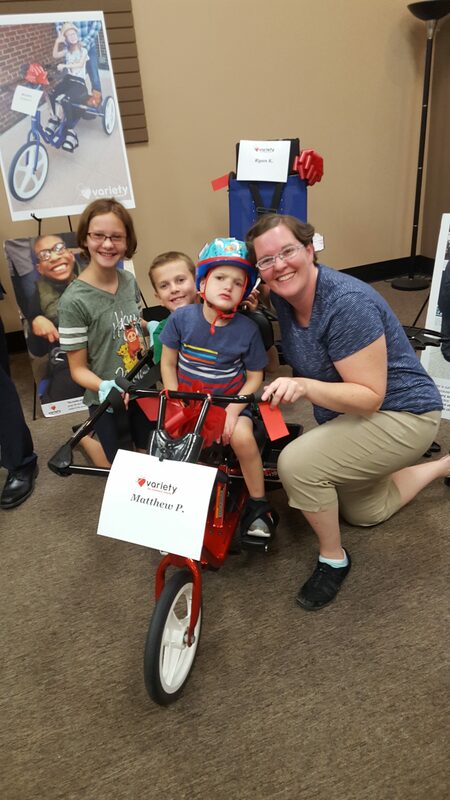 Connor, age 8 is pictured above with excitement on his new RED adaptive bike! 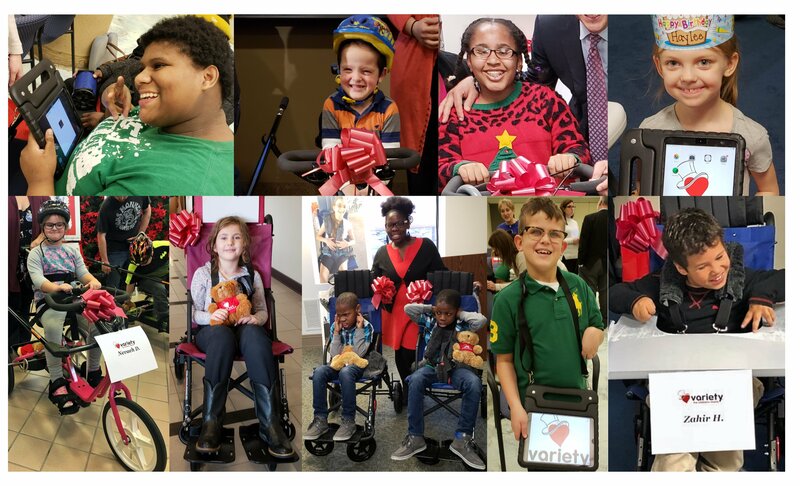 This past Wednesday, July 25th, Variety presented 34 more pieces of adaptive equipment to kids with disabilities at the Pittsburgh Mills Mall hosted by Blackburn’s. These children (like Connor) now have an opportunity to discover EVEN MORE possibilities for their lives, and be a kid, first and foremost. 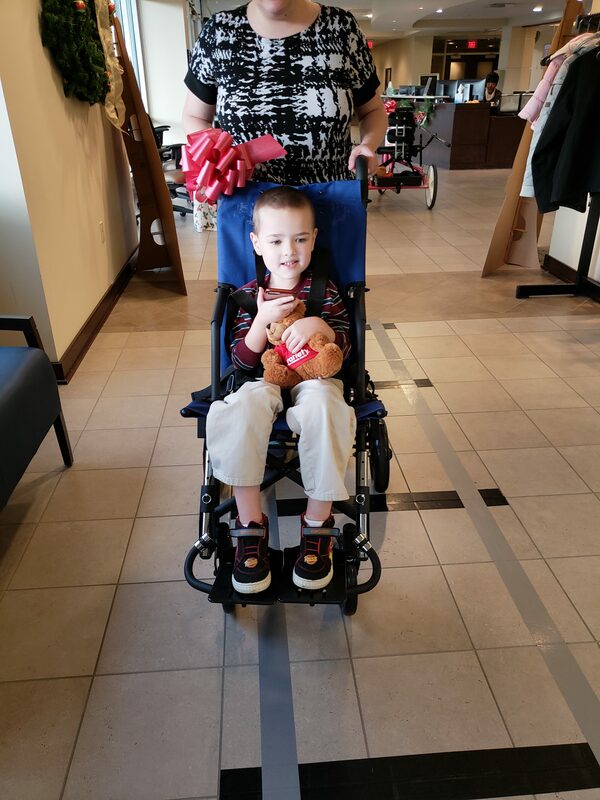 Ryan, age 17 received an adaptive stroller and communication device on Wednesday. Ryan is pictured above left with his best friend Jacob a Variety Ambassador. 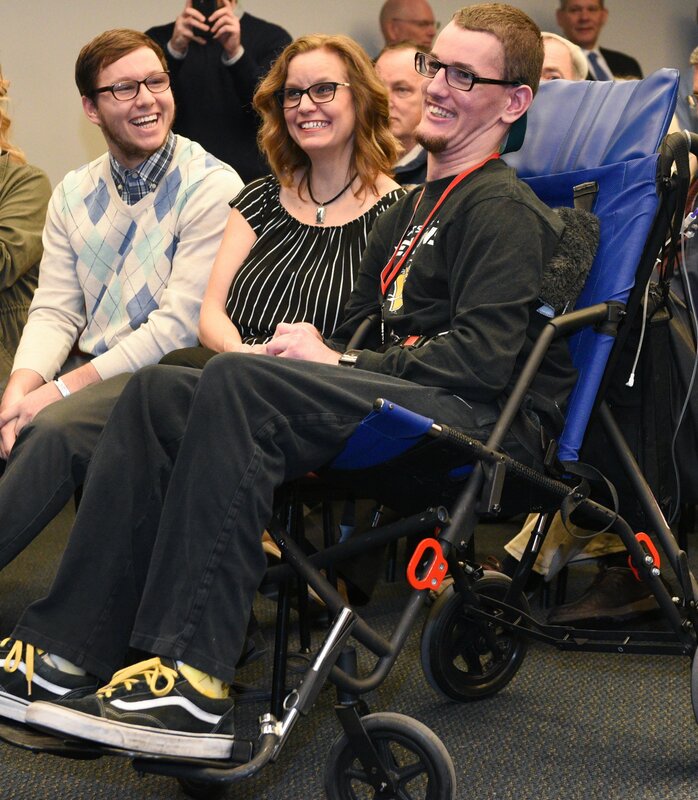 Ryan shakes Jacob’s hand in joyful surprise that he’s in attendance at the presentation. 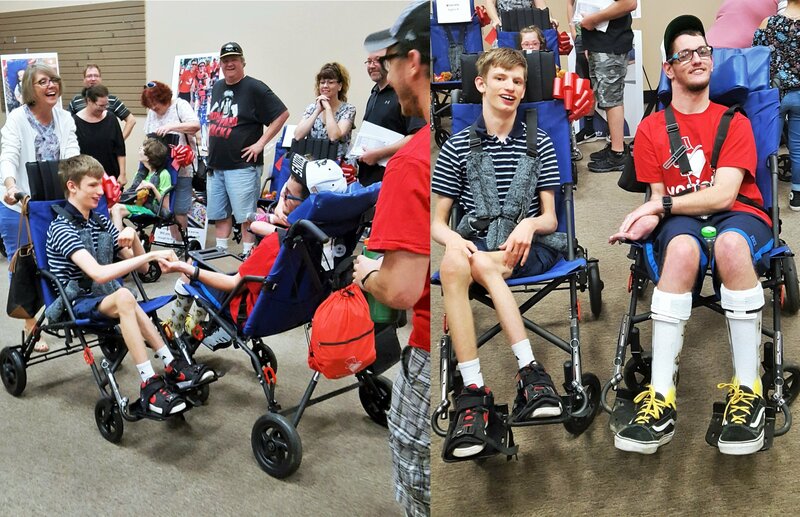 It was a surprise for Ryan to see his best friend, Jacob at Wednesday’s presentation, but the two couldn’t have been more excited. 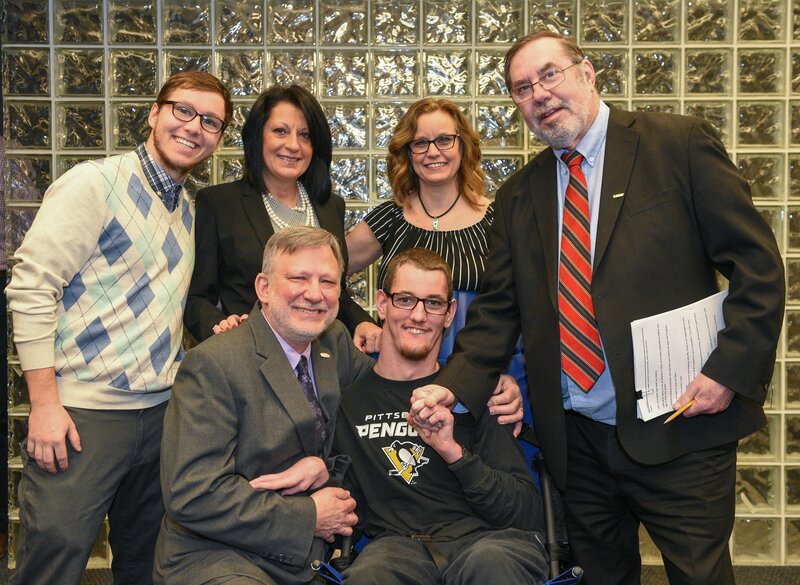 They both play for the Mighty Pens sled hockey team, and Jacob has been volunteering his time as an Ambassador to Variety to help impact more kids. To make the day even more special, Ryan used his new communication device immediately on Wednesday to talk to his best friend, Jacob. You can watch what Ryan had to say by clicking here. Here’s to even more smiles and possibilities rolling on through the summer months! 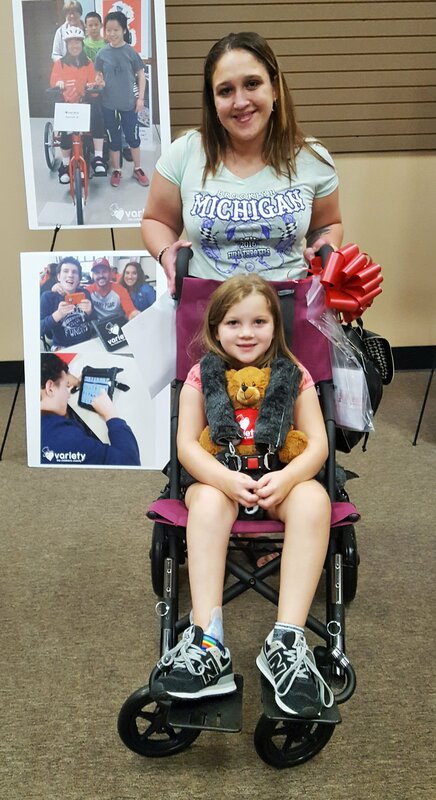 Janessa Shared Her “New Voice” Before 15 Kids Received Equipment! 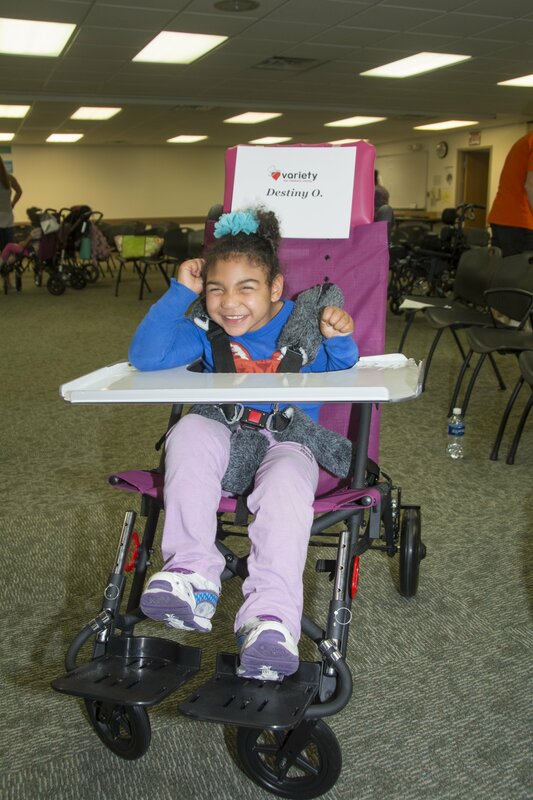 On Friday, March 23rd, Variety presented life-changing equipment at the Capital Area Intermediate Unit (CAIU) to 15 local kids with disabilities with each piece individually tailored to meet their needs. 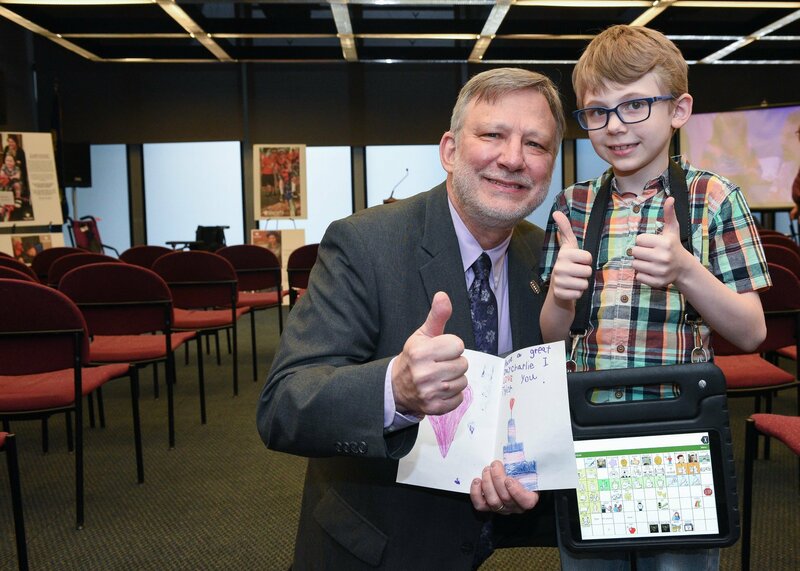 Prior to our presentation, Janessa, age 11 kicked things off by demonstrating how she uses her communication device – her new voice – that she received from Variety last November. Janessa is pictured with her mom and Variety’s CEO. 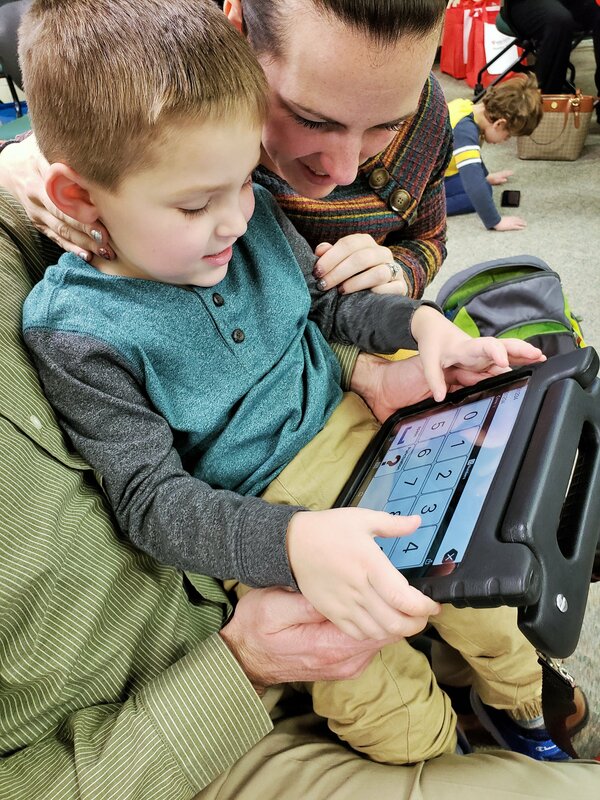 Since receiving her device, Janessa has been featured in two television spots through Highmark’s Living Proof campaign, one in which she uses her device to talk with her doctor for the first time, and then another to order food at a restaurant for the first time. 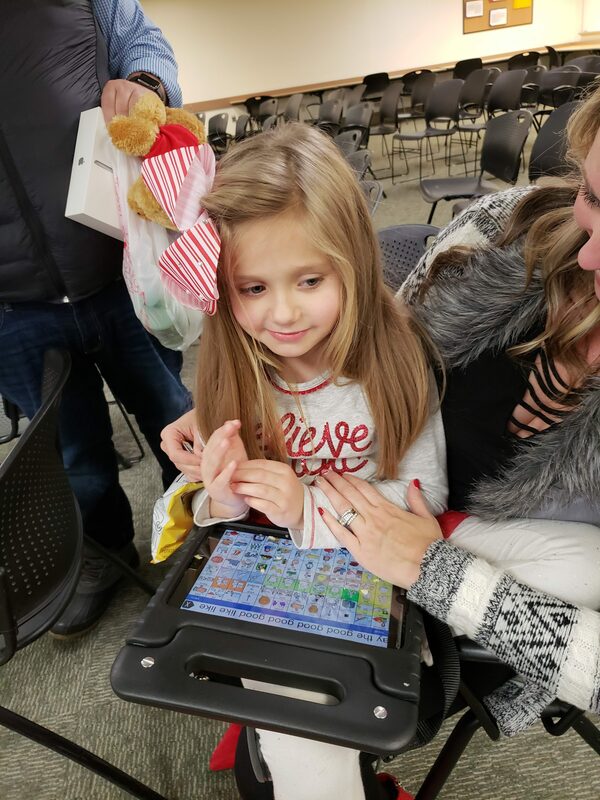 One of the most meaningful moments of the event was hearing Janessa’s mom, Julie update us on the progress and impact that has taken place for Janessa, and ultimately, her entire family since receiving her device (her new voice) – click below. 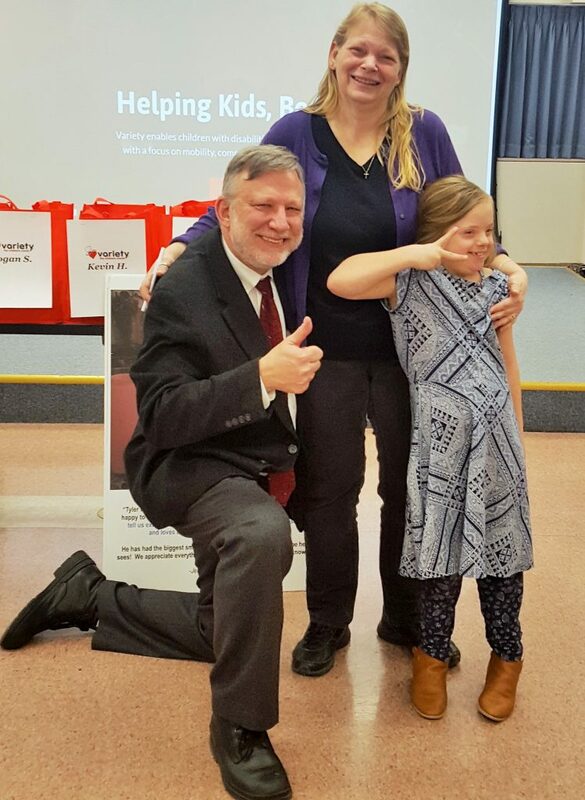 To give you even more to smile about, thanks to Janessa, three of her classmates received communication devices as well, including Ryan, age 9, who was more than a little excited. 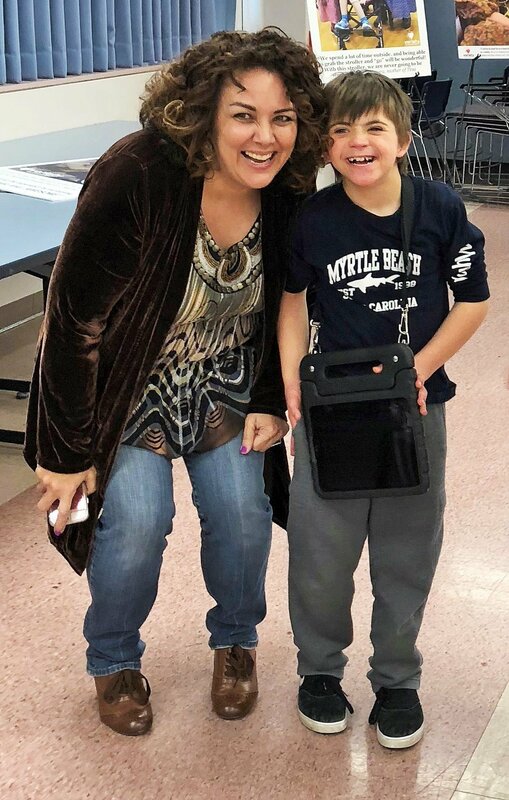 Ryan is pictured above with his mom holding his new voice! 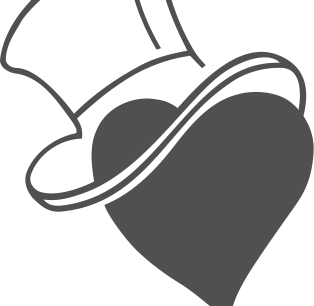 “Ryan’s greatest ability is his love of reaching out to people and attempting to communicate his wants and needs. He often launches into very long and animated stories complete with hand gestures and big laughs. Unfortunately, his educators, classmates, and many loved ones cannot understand him because they are his own made up words and not real words. 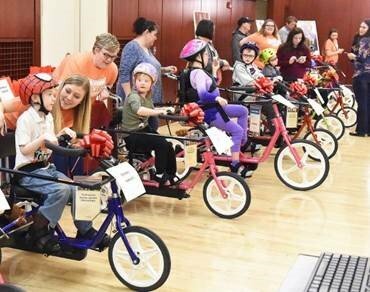 The March 23rd presentation also featured a terrific “equipment parade” with cheers of celebration that I’m sure you’ll enjoy – click here to watch for yourself. To our knowledge, history was made yesterday in Morgantown, West Virginia for kids with disabilities. 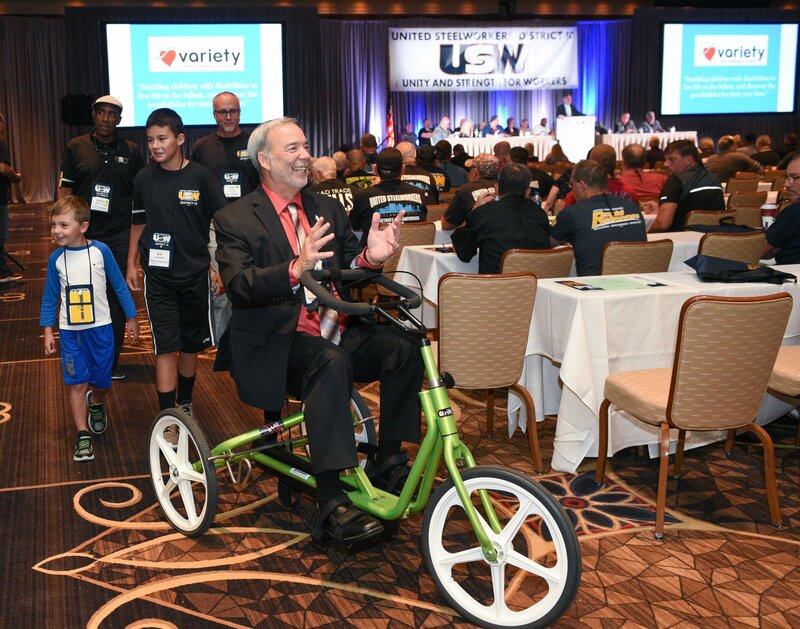 In one afternoon, Variety hosted the largest presentation of adaptive equipment for children with disabilities with 45 kids receiving equipment (worth more than $70,000) – including 26 adaptive bikes, 8 adaptive strollers, and 11 communication devices. Above is a photo from the Dominion Post that appeared on the front page of The Dominion Post! 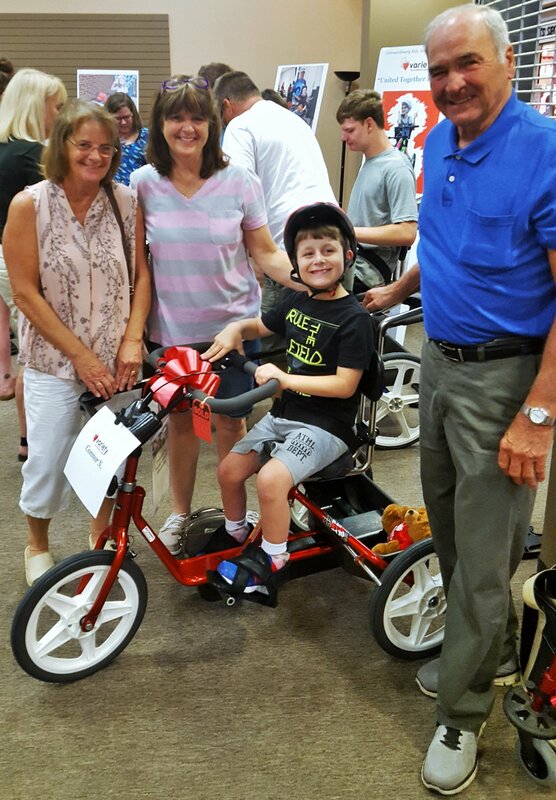 As we have all come to experience, the kids were truly the stars of the show, like Deklan, age 7, who couldn’t have been more excited as he continually gave “thumbs up” in response to getting his brand new blue adaptive bike! 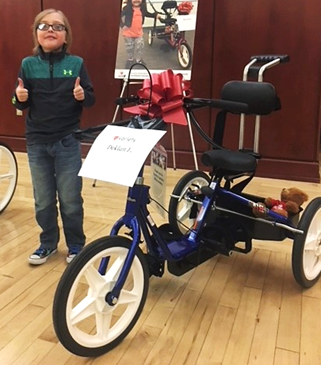 Deklan gives two thumbs with pride standing next to his new blue bike! Another highlight yesterday was two teenagers, Hannah and Macey, who are best friends. 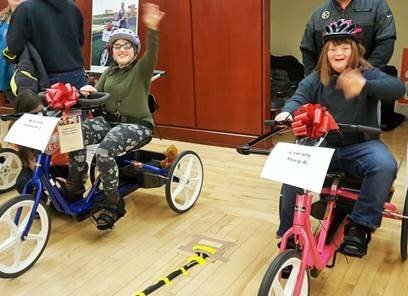 They did not know until they arrived at the presentation and saw each other that they were both receiving an adaptive bike of their own. 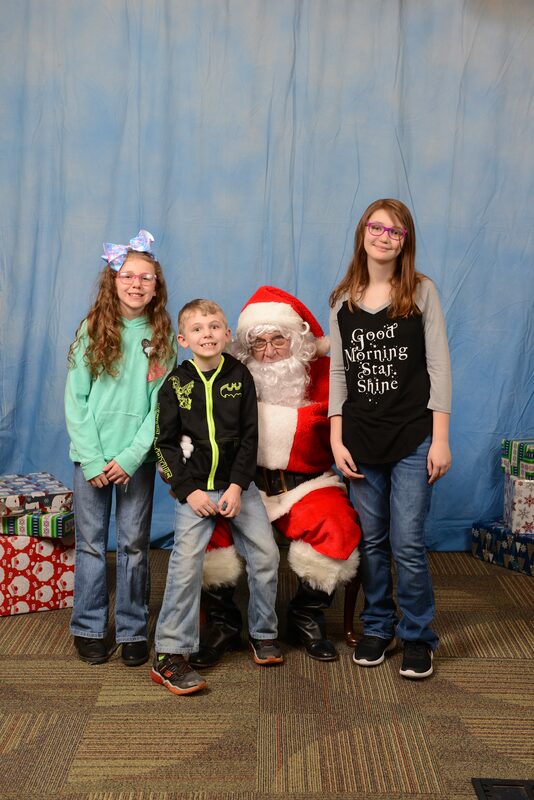 Pictured above is Hannah and Macey – all smiles! Hannah received a blue bike and Macey a pink one, and they spent the afternoon jumping up and down with joy, hugging each other, screaming with excitement, and telling their parents about all the bike riding they were going to do together. They even got to enjoy the bike parade together. I wish everyone could have been there to see this phenomenal moment of joy that these two best friends shared – we are so fortunate to be a part of it these beautiful moments. Check out these three news pieces that came from this beautiful day. 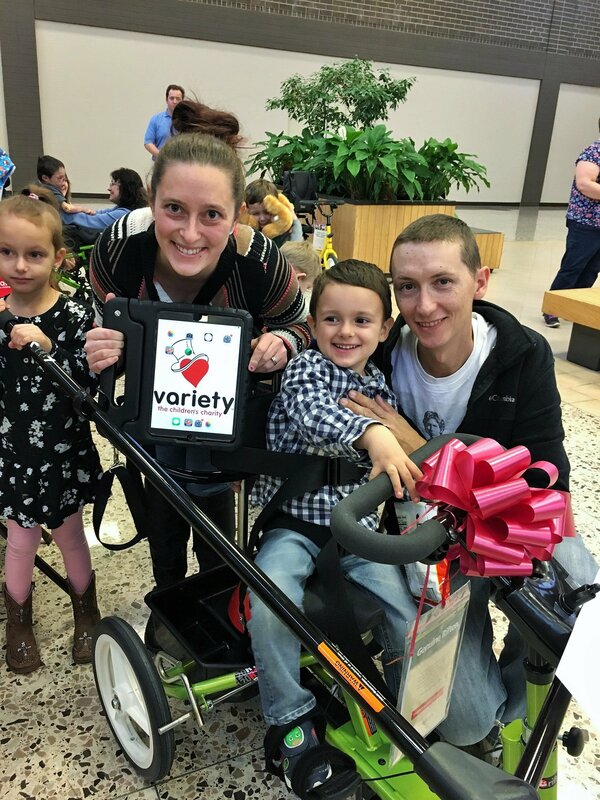 Variety – the Children’s Charity of Pittsburgh is striving to identify & serve every eligible child that could benefit from its adaptive equipment programs. 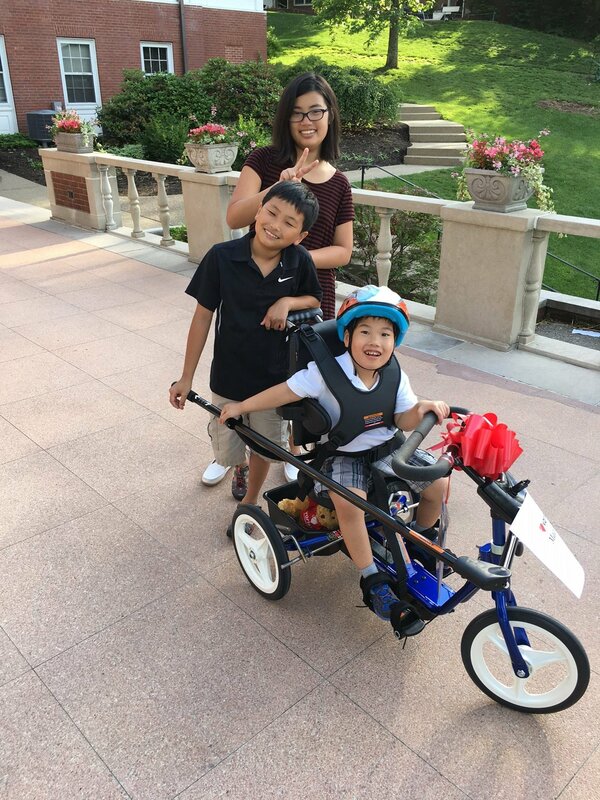 Do you know of any children with disabilities that could benefit from an adaptive bike, adaptive stroller, and/or communication device? 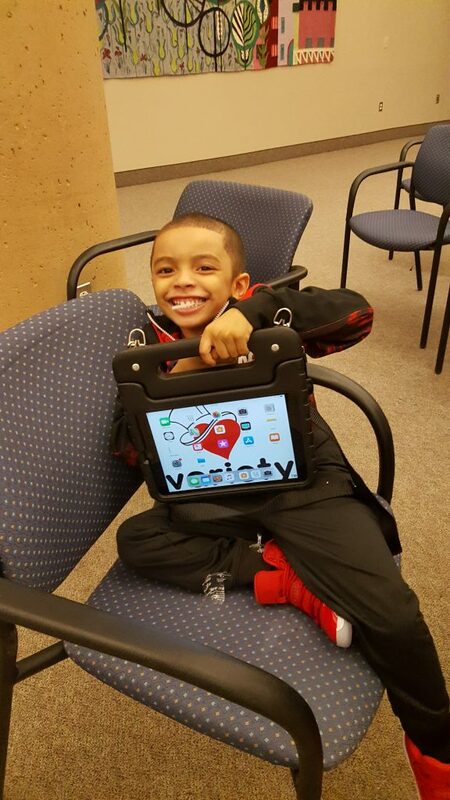 Variety is currently serving kids in 54 counties in Pa. & WV. 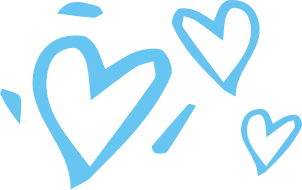 These programs are life changing for kids & their families, but Variety needs help with spreading the word, so no family misses out on these opportunities. Visit www.varietypittsburgh.org or call their office at 724-933-0460 to learn more or apply. These programs are no cost to eligible families, and you can apply for one, two, or all three programs if your child can benefit! Madon is all smiles on his new blue bike! 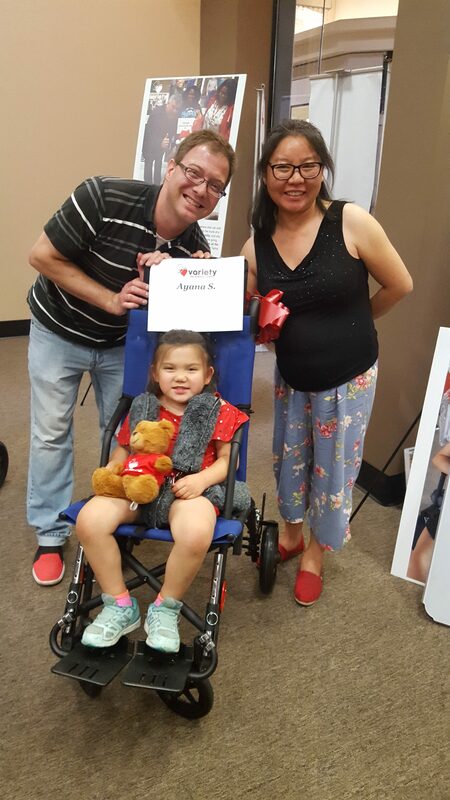 Destiny is feeling comfy in her new adaptive stroller! All smiles holding his new device – his new voice!